Powerful Hollywood women are starting off 2018 in style: By kicking down the door that protects sexual harassers of every stripe. In a front page story of The New York Times, actresses — including Eva Longoria, Kerry Washington, America Ferrera, and Reese Witherspoon, to name a few — announced that 2018 was officially the year they’d devote themselves to curbing systemic sexual harassment industry-wide. The powerful cover story features photos of famous, award-winning, and diverse women in Hollywood who have a message for abusers: #TimesUp. As director DuVernay’s post mentions, this is *not* a drill. 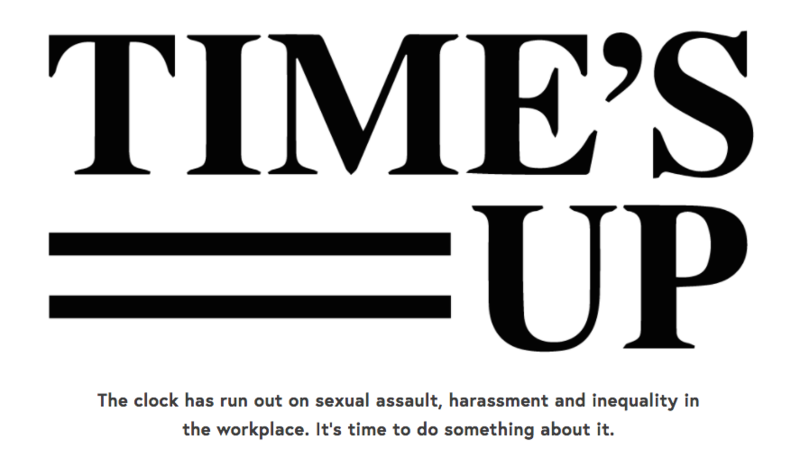 #TimesUp on not just sexual harassment, but abuse, marginalization, and underrepresentation in Hollywood as well. The campaign is looking for $15 million. At the time of publish, it was just shy of $14 million after half a day. It’s inspiring to watch the #MeToo movement makes the jump to Hollywood, and energizing to those exhausted by trying to make their voices heard. Seeing powerful women stand up and call out inequalities in race, gender identity, sexual orientation, and more — it’s invigorating. More than that, though, it’s a call to arms. The current generation of Hollywood A-listers is linking arms, standing together, and inviting the next generation of producers, directors, writers, and stars to join them in a safer and more equal environment than they’ve ever experienced. This is just the beginning of Hollywood’s #TimesUp movement. It will be interesting to see how this unfolds at the 2018 Golden Globes, at the Academy Awards, and throughout the rest of the year — heck, for the rest of time. The website also includes resources on how to stop harassment, spot harassment, and resources you can provide to others. You can add your voice and get involved right here.